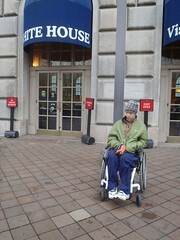 The last time we went to the White House Visitor Center was back in 2006. It really has not seemed to changed much since then other than the video they show is at least partially updated with there being footage of the Obamas. Interestingly, though, some areas still do not include them, such as the Presidential medals display not including Obama. If it was 2009 or even 2010 that would be understandable, but seriously its 2012 and it seems ridiculously outdated. Now if they just stopped doing the Presidential Medals, then it should at least say something about it. However, I rather doubt the tradition has ended. The Visitor Center was still worth a visit for us, though, as we got 2 stamps for our National Park Passports. One is for the Star-Spangled Banner National Trail and the other is for President's Park - The White House. 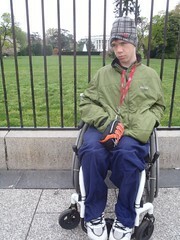 Overall the White House Visitor is still a nice stop, if you have not been there, yet. They have a button operated automatic door. The security check requires all bags and stuff in your pockets to be put through machine, but they did not do a pat down of Mik like at the airport. However, they did ask for him to lean forward to make sure he was not hiding anything behind his back. Also, if you walk through the metal detectors are on here, which is not always the case at the Smithsonian Museums where at least this time of year are usually just looking through bags. After the Visitor Center we were going to just head over to some memorials on the National Mall, but I realized Mik did not remember ever actually seen the White House in person. He might have when he was little, but I am pretty sure even in 2006 we did not walk up to it. We just went and saw it from the Ellipse side, which coming from the Visitor Center required a rather round about way of going the long way around a statue (Sherman?) due to the road blocks and steps by the quick way to walk in. However, it is not a big deal and really it is better to walk further and view the White House from the Lafayette Square side, which provides a closer view and there are some good statues to look at in the square. It was cold and we were trying to get the memorials done as much as possible before it began to rain, so Mik was only up for the viewing it from what was closest for us at the time.